Already Have a Bachelor's Degree in an Unrelated Field? What are the Required Certification Exams for Teachers? How Much Do I Expect to Make? A great teacher has the power to change lives and ignite a passion for lifelong learning. To secure our future, we need to ensure that our students feel empowered and inspired. To make this happen, we need educators who are willing to go above and beyond in order to challenge and be innovative within the broad field of education. Are you passionate about education and the welfare of children? Do you think you can guide and motivate children? Do you have the ability to create meaningful learning experiences for children? Do you see yourself as a creative and innovative person who can surpass traditional teaching methods? If so, teaching may be right for you. It is important to note that careers within the field of education can be broad. Generally, education includes careers in teaching, administration, library science, counseling, and more. Within teaching, there are even multiple levels one can choose to focus on like elementary, middle, or high school education. Deciding on which subject or level you wish to teach can be one of the most difficult decisions. Select from the dropdown menu below to read more about all the different education related careers to choose from. Our career pages will give you more insight and information on specific careers within the broad range of education. Although every state has different requirements for becoming a certified teacher, most require that candidates hold at least a Bachelor's Degree, complete a Teacher Preparation Program, and pass the required state examinations. Perhaps consider a masters in education degree which is considered by many the most popular avenue for post secondary education process. Below you will find the basics to help you better understand what will be expected of you. However, to determine specific requirements for your own state, visit our state pages. In all states, you will find that a basic requirement to become a certified public school teacher is to earn at least Bachelor's Degree from an accredited college or university. Depending on specific state requirements, high school teachers may also be required to have majored in a specific subject area related to the area they wish to teacher. Many aspiring elementary school teachers who know from early on they want to teach, decide to earn their Bachelor's Degree in subjects such as Early Childhood Education, Liberal Arts, or Education. In most cases, many degree options give candidates the ability to complete a teacher preparation program alongside with a degree. The greater majority of states require their teachers to complete an accredited teacher preparation program prior to becoming certified. See our degree pages to help you choose a major within the field of Education. The list of degrees are related areas of study that may also provide a pathway to a career in education. Follow each link to learn more about each degree and which may be right for you. Many accredited colleges and universities offer blended degree and teacher preparation programs. This is true for both Bachelor's Degree programs and Master's Degree programs. This is a great option for candidates who know they want to become a teacher prior to enrolling into the program. These type of blended or joint programs methodically combine all the required coursework for your degree (Bachelors or Master's) along with the classes included in a teacher education program. These combined programs are usually rigorous but very beneficial. 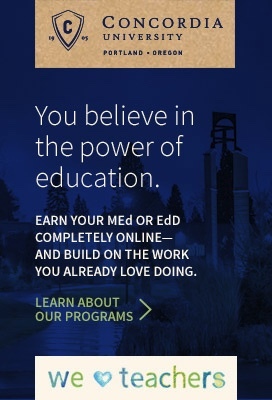 Have you considered an online teaching degree? If order to qualify for teacher certification, candidates must complete an accredited teacher education program. If your undergraduate program did not include a teacher education program, you may attend on that is accredited by the Council for the Accreditation of Educator Preparation (CAEP). Depending on the college or university, teacher education programs can also be referred to as initial teacher training or teacher preparation programs. These programs equip pre-service teachers with the skills and knowledge needed for a career in education. In most cases, candidates can complete their teacher preparation coursework as a part of their Bachelor's Degree. The curricula of teacher education programs often include a focus on foundational knowledge, student learning and assessment, content-area knowledge and methods, as well as fieldwork. In order to provide foundational knowledge to pre-service teachers, many teacher education programs teach their candidates about the philosophy and sociology of education as well as theories and the history of education. Student learning and assessment refers to how students learn and best practices for measuring the learning. Often times, schools will focus on the importance of authentic assessments and assessing students through multiple modes. In addition to assessment, it is important to think about individuals students and how they learn. In a classroom, a teacher will likely have a very diverse student population, including students with special needs and differing language acquisition skills. It is imperative to consider their needs when teaching and assessing. Content area knowledge and methods relates to the actual subjects you will teach and the best practices for teaching them. This will vary from teacher to teacher as some will aspire to teach multiple subjects in elementary school while others will decide to teach a single subject at the middle or high school level. The fieldwork aspect of a teacher preparation program usually includes supported practice in an actual classroom, also knows as "supervised field experience". Supervised field experience will often include a combination of classroom observations, student teaching, or interning. During student teaching, a pre-service teacher works with a mentor teacher for a specified number of weeks teaching in an assigned classroom. The pre-service teacher collaborates with the experienced teacher to plan, deliver, and assess lessons. In most cases, a university supervisor will also be a part of the mentoring process. Given all the benefits of teaching, becoming a teacher can spark interest in people at any point in their lives. In many cases, people switch to teaching after several years of working in another field. With that said, if you already have a Bachelor's or Master's degree in a field that is not related to education, do not worry. Most states offer alternative routes to certification designed specifically with you in mind. Many colleges and universities, both online and on-campus, offer teacher education programs that are not linked to a degree. This option is great for individuals who are looking to become a certified teacher after earning a degree in an unrelated field. It is important to participate in a program that is accredited. Some teacher education programs may ask that their candidates pass the Praxis Core exam (or other equivalent state exam) prior to entering the program. This type of exam measures overall academic skills in mathematics, reading, and writing). Of course there are many other routes you can take. Depending on the state you live in, there can be other approved alternative routes to certification. See our state pages to find your state and some alternative certification programs. However, Teach for America and American Board for Certification of Teacher Excellence (ABCTE) are programs which are accepted in many states. These type of programs often allow you to begin your career as an educator right away while completing your teacher preparation requirements. In order to become a certified teacher in the United States, candidates will be required to pass certain exams. Although each state has different and specific testing requirements, most states require their candidates to pass at least a fundamental skills test as well as a subject area competency exam. In order to qualify for teacher certification, candidates are usually required to pass a Basic Skills exam. This requirement is commonly fulfilled by taking he Praxis Core exam or other equivalent state exam. The basic skills test, or fundamental skills test, measures a candidate's overall academic skills in mathematics, reading, and writing. This type of exam is often taken prior to entrance into a teacher preparation program. The subject area competency assessment generally assesses a candidate's skill in their specific K-12 subject area. Elementary school teachers are often required to pass a multiple subject assessment, since elementary school educators teach multiple subjects at the foundational level. Middle school and high school teachers will need to take the correct subject-specific examination that applies to the area they wish to teach. For example, a prospective high school Social Studies teacher would need to take the Social Studies series of assessments. In most cases, taking the Praxis series of exams can fulfill these requirements. However, many states offer and prefer an equivalent state examination. Many states may also require additional exams. For example, California requires persons seeking credentials in Elementary Education to also take the RICA (Reading Instruction Competence Assessment). Find your state on our state pages to learn more about some of the specific exams that will be required for you. Although private schools are not required by law to hire only licensed teachers, in most cases, a license is preferred. Private schools are more autonomous than public schools as they can create their own policies and standards. With that said, a school can decide to hire you with or without proper teaching credentials. The choice is entirely up to the individual school. Since most private schools prefer certified teachers, many schools will hire an individual without the proper certifications under the stipulation that the candidate continues his/her education. Whether certification is required or not, it is recommended that all teachers earn the proper licensure so that they can earn job security and not be limited in their career choices. Teaching is a career where lifelong learning is highly regarded. Many public school districts may even require their teachers to continue their education while they are teaching. In many cases, schools require their teachers to complete a specific amount of professional development courses. Most districts even offer salary points for each additional class taken. In other words, many districts compensate their teachers for continuing their education. Continuing education can improve a teacher's instruction as well as student achievement. Continuing your education can also allow you to make career advancements within the field of education. Many teachers seek to be recognized as the top of their profession by voluntarily obtaining National Board Certification (NBCT). The NBCT is an advanced teaching credential which surpasses state licensure. Obtaining National Board Certification requires a lot of dedication and work. Educators will go through a peer-review process and will be required to submit videos of themselves teaching as well as samples of student work. This process is to display a teacher's development and achievement. In addition to the peer review process, NBCT candidates will be required to pass an assessment. NBCT teachers are highly respected and valued. Although most passionate educators do not enter the field of education merely for the compensation, it is definitely something to consider when choosing a career. It is important to note that salaries vary greatly from state to state. Use our salary comparison tool to search and compare the average salaries of various public education careers around the United States. Our salary data is sourced from the Bureau of Labor Statistics (BLS). Keep in mind that salaries can be increased if you decide to teach summer school or continue to advance your own personal education. In addition to a teacher's solid yearly salary, public school teachers can earn great benefits! The benefits public school teachers receive often surpass those of other industries. Many public schools provide great health and retirement benefits. Public school teachers usually have their health coverage fully paid for by the school including vision and dental. Moreover, teachers usually get a generous amount of sick days per year as well as personal days. Public school teachers also receive retirement and pension benefits through the state. Another great benefit to teaching is the hours. Although the exact hours teachers work can vary from school to school, most teachers are required to be on campus from about eight in the morning to three in the afternoon. In addition, teachers usually only work Monday through Friday. Note that teachers also encounter many longer days such as parent-teacher conferences, open houses, attending workshops, and more. It is also important to consider time it takes outside of the regular school day to plan and grade lessons. Yet another benefit of a career in education is the vacation time. Depending on the school district, teachers generally work about 180 days per school year. With that said, teachers usually get a few weeks off during the winter for the holidays, a few more weeks off during spring, as well as almost three months off in the summer! In addition to these breaks, most schools also observe all national holidays. Another small perk is all the teacher discounts many online outlets and companies offer. Feel free to browse through our teacher blogs to get insight scoop of what teachers and administrators have to say about the profession.